Talia sprang into the public eye when Mike Baker of the Seattle Times published his story about her, “A Lost Voice.” In the article, he quotes from a letter Talia wrote to her teammates when she had to give up her dream of playing college soccer because of multiple ACL tears in her knee. In it, she declared emphatically that, in spite of everything, she was still a person with dreams, hopes, beliefs; that she remained “a person with a voice.” Years later, the many providers who failed Talia would steal that voice. It is truly intolerable that Talia—a person who was so gifted at listening herself—was not returned the favor by her medical providers, whose job was to listen to their patient. Indeed, that failure to listen cost Talia her life. For us, Mike Baker’s article was like a “P.S.,” a post script to Talia’s life. He brought to light—after she was dead and gone—a post script about young woman who understood how to embrace life and live it well; who, through pain and physical setbacks and some heartbreak, still found love and meaning, and continued to use her voice to create, to connect with others, and to express herself fully, in joy and in pain. It was uncanny the way the Times visual team used Talia’s art for this “P.S.” story: she illustrated her own demise from the grave. In the aftermath of “A Lost Voice,” many things happened, all big for us. The CEO at Swedish resigned. Talia’s neurosurgeon resigned and later had his license suspended in the state of Washington. One of us (Naomi), wrote an op-ed for the first time ever. The Department of Health and the Feds opened investigations into Swedish Hospital, and later cited them in multiple areas for failing to meet a safe standard of practice (an investigation that included Talia’s case). 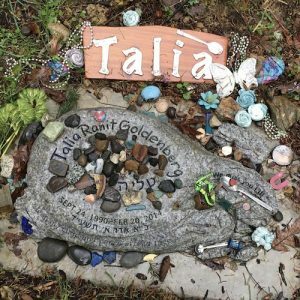 After “A Lost Voice” was published, we decided to launch a non-profit in Talia’s memory and dedicated to patient safety. It felt right to use “Talia’s voice” in the title. She was so solid in her knowledge that she mattered, that she was powerful in her own right, simply because of who she was. It’s unforgivable that her voice was stolen from her—and that’s what Mike Baker’s article showed so beautifully. Now, in her memory, we are doing the only thing available to us: continuing to give Talia’s voice a way to reverberate loud and clear in the world, just like she did when she was alive. It’s not nearly the same thing as hearing her real voice: her infectious laugh, her excitement and pride in her accomplishments; the way she exclaimed delightedly; the tenderness of her voice when she taught children, modeling for them the way to their artistic souls or the way into the heart of an elusive math problem; the intensity of her voice when delving into deep discussions about anything that mattered to her; and of course, the screaming, plaintive, or whimsical voice she called on to create art, which she shared with everyone. That voice will never be heard from again. But in memory of our blue eyed bouncy girl—in honor of the fine person Talia was—we, too, will scream out against a culture in medicine that far too often costs people their lives. Because Talia, sadly, is not the only one. Medical error—in particular, medical error caused by failures in communication—killed many patients before Talia and many since; and even when death is not the final outcome, unnecessary complications cost many, many patients in ways big and small. It was only after we chose to call ourselves Talia’s Voice: Projects for Patient Safety, that we realized the serendipity at work in our choice of names. If “A Lost Voice” was the post script to Talia’s life, our organization is the P.P.S.—Projects for Patient Safety doubles, it turns out, for “post post script.” So in this way, our organization’s name is about Talia, but also gives a nod to Mike Baker, who through his investigative work, brought to light what happened to our girl. We at Talia’s Voice are ready to do what we can to change the culture in medicine. We know it won’t happen overnight—change is always hard and many of the problems are well-entrenched. But here’s the thing: Talia was known everywhere for her work ethic and her perfectionism. She never gave up. Never. And so, if we are to do this in her memory, for Talia, we can’t give up either. The fight will be long. As an new organization, we will take the time to figure out where best—in addition to telling Talia’s story—to focus our efforts. But we’re dedicated to seeing this through. Where Talia is concerned, how could we do anything less?